I lead a double life. By day I am a mild-mannered creative manager at an advertising agency, accommodating clients’ unfair demands (which is why, they pay me the middle to small bucks! ), but by night, I am a voracious reader, a reservoir of useless pop culture, a connoisseur of eclectic music, a hippie at heart and a caped vigilante espousing various social justice causes. So, presented with the opportunity to offer my two cents’ worth on recent campaigns, I naturally chose those that had a message that resonated with one of my many adoptive causes. Although not without flaws, these ads warm the cockles of my heart and speak to a larger trend of the industry maturing as a whole, slowly but surely. Message: A mother will always have time for her son. Effectiveness: This ad seems to have its heart in the right place. The boy is adorable and the family is sweet. The busy mother never has enough time for her son; she can’t juggle a successful career and family at the same time. But wait! She has found the perfect solution. She communicates with her son through notes in his lunchbox. On the surface this seems like a great idea, but once you get past the schmaltz, you realise it is actually a terrible idea. You repeatedly ignore your kid at the dining table when he tries to talk to you and he is going to stop confiding in you. And sending written notes in Urdu, so difficult that a child of 10 cannot comprehend, is not going to cut it. This is another issue. How about making the language less precocious and more child-like? I’m looking at you Oreo! Verdict: The little boy is an afterthought for the mother; the message is the opposite of what they wanted to convey. Message: Not everything is what it seems. Effectiveness: A young woman complains about her boss to her friend because she is forced to drive to her house to pick up a contract. When she gets there, the front door is open so she enters, which is problematic. She comes face to face with her boss’ mother, who is in a wheelchair and is holding the contract (slowly rolling forward, like a villain rising from the mist). She is needlessly terse with this intruder. For some reason, the young woman starts to cry. The boss walks in holding a tub of laundry. She lives in this massive house, why doesn’t she have a maid or a washing machine? Problems aside, what I did like about the ad was the concept of giving people the benefit of the doubt. Not all boss ki chamchis are doing favours for the boss. There are hardworking women out there and compassionate bosses. Verdict: A step in the right direction. Message: We will handle the mechanics; you concentrate on your relationships. Effectiveness: For the most part, I liked the Kenwood campaign. Groundbreaking, because the P&G method of product-selling was not employed. For once, the product doesn’t come to the rescue, dues-ex-machina. The focus is the frailty of human relations. The ad encourages husbands and wives to cut each other some slack. Revolutionary! An ad from the series I did have a problem with, was the one about the washing machine. The use of the term dhulai in all its various puny forms may seem too delicious not to be used, but domestic abuse is no laughing matter, no matter how funny you try to make it look. I was not amused and it left a bad taste in my mouth. Verdict: As Meatloaf would croon “Two out of three ain’t bad”. Message: We need to put our back into it and get things done. Effectiveness: Most of Osaka’s tongue-in-cheek ads have slid under my radar, although I suppose they resonated with the target audience. Their recent ad did catch my attention and I appreciated it. 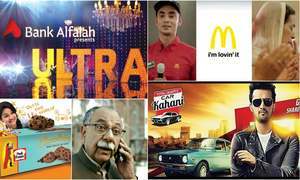 Sohail Ahmed is one of the hosts of the show Hasb-e-Haal; a satirical show on politics. In light of this, the dhaka start jingle for Osaka was witty and on point. An endorsement for PTI that is about as subtle as a sledgehammer, the ad shows random people ticking off the boxes on their bingo card to win the corruption jackpot. Everything from plain laziness to bribery and palm greasing is addressed. My only criticism is that the ad is a tad too long and could have done with some editing. Verdict: One of the better car battery ads I have seen. At least it has a message to convey. Message: Can’t we all just get along. 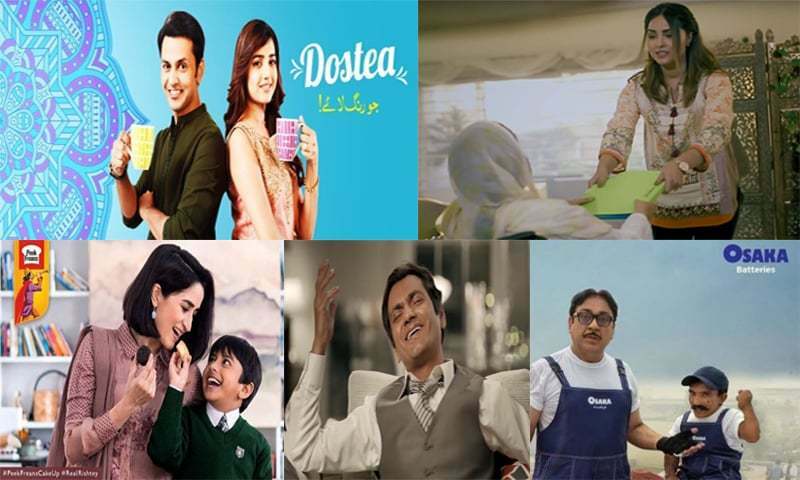 Effectiveness: A product called ‘Dostea’ and an ad campaign culminating with a remix of the Nazia & Zoheb classic ‘Dosti, aisa naata’ is something made in schmaltzy advertising heaven! As soon as I heard the name of the product, I knew this was what they were going to go for. 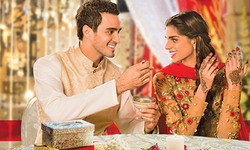 The shaadi song was a little overdone (a little like the Tarang cringe-worthy ads without the glitz and glamour). What they went for was one of those Indian films with huge joint families getting in on the singing and dancing action. Did they succeed? I suppose. Didn’t love it. What I did like was the series of ads leading up to this. They show joint families in a favourable light. They understand that a young woman has trepidations and reservations about moving in with a huge family and the family eases her transition by being friendly and approachable. Another thing I liked is the reversal of roles. The older brother is a chef while his wife is a doctor. The grandfather is a poet while the grandmother likes to hunt. I hope they continue to make such ads and turn expectations on their heads. The best one out of all ads is undoubtedly the Dostead ad. Can you please keep your commercials to 30 secs max? It is a pain to watch a movie-like ad on a repeat basis! I think that channise lady making vibrancy with Shone Masalles is also of the caliver of your selection. 'Dosti, aisa naata' is not a Nazia-Zoheb classic. It was sung by a young Afshan Ahmed in Sohail Rana's show. Nazia-Zoheb's 'Dosti' is a diferent song. ‘Dosti, aisa naata’ was a Sohail Rana classic and had nothing to do with Nazia & Zohaib.